Isabel is an enthusiastic and motivated individual, who fell in love with music at an early age. She began playing the flute at 11 years old, and has since aimed to share with others the joy that is music. Having acquired her Bachelor of Fine Arts, Hons, Spec. in Music – Classical Flute Performance, Isabel has performed concerts and recitals both in the Symphony and as a soloist. 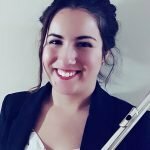 She is the winner of the 2017/2018 York University Concerto Competition, performing a solo concerto for Flute and Orchestra. She possesses performance experience with various ensembles, and reaches beyond the concert halls to work with music students of all ages and learning styles.